aboot 1,000,000 accordin tae Caesar which mainly includes civilians killed. Modren estimates at least hundrits o thoosands. 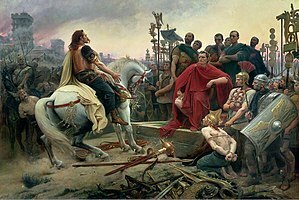 The Gallic Wars wur a series o militar campaigns waged bi the Roman proconsul Julius Caesar against several Gallic tribes. Roum's war against the Gallic tribes lastit frae 58 BC tae 50 BC an culminatit in the decisive Battle o Alesia in 52 BC, in which a complete Roman victory resultit in the expansion o the Roman Republic ower the whole o Gaul (mainly present day Fraunce an Belgium). The wars paved the way for Julius Caesar tae acome the sole ruler o the Roman Republic. This page wis last eeditit on 26 Februar 2016, at 13:05.